That night, of course, it didn’t. After the walk had failed Ryan decided to throw his body at the problem, commencing to march Jay up and down the five flights of stairs in their building. Jay fell asleep just before Ryan’s quads gave out, but as he nodded off he hit his head on Ryan’s shoulder blade, setting off another round of wailing. When Caroline and I returned hours later, Ryan looked like he’d been trampled by a pack of baby monkeys. I’m pretty sure the trauma of the evening set back his childbearing desires at least half-a-decade. I thought of this yesterday morning as I waited for Ryan and Allison to arrive in Philadelphia on the bus down from New York. Over the five years we’ve lived in Philadelphia they’ve made the trip often. They were the first people from my family to see Jay after he was born, and more recently they’ve become Jay’s favorite visitors. When we walk around the city and he spies a silver Ford he calls out, “Ramen and Allie’s car,” recalling the rental they drove to Maine this summer. It’s always with a touch of sadness that I tell him that though the car might look like theirs, they’re not actually here. This trip was to be their last to Philadelphia, at least while we’re living here: On August 19th we’re moving to Ann Arbor, where Caroline has a research job at the university. We’d have signed up for 30 more years in Philadelphia if we could, so the move is bittersweet—not least of all because it puts half-a-continent between us and the most important people in our lives. But such melancholic thoughts were out of view when Ryan and Allison arrived on our front stoop a little before noon. 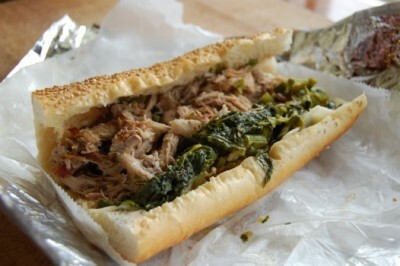 I had in mind that we’d all walk over to the Italian Market for sandwiches at Paesano’s. The heat, though, was more than I reckoned, and by the time we arrived 15 blocks later at the un-air conditioned sandwich shop we were staggering. We shared the Paesano (beef brisket, sharp provolone, fried egg), and the Arista (whole roasted suckling pig, broccoli rabe). The grease from it all combined with the humidity to put a happy sheen on our faces. All might have been perfect but for Jay, who was just tall enough to reach the levers on the soda machine and was little persuaded by the argument: we haven’t paid for that. There was no urgency to their trip until the end. As they gathered their things to leave I said to Ryan, “We’ll see you again in…” And then I realized how long it might be. Not over Labor Day because we’ll be in Michigan. Not over Thanksgiving because we’ll be with our spouses’ families. It was hard to believe, in the midst of a day that felt so familiar, that we might not see each other again until Christmas. Outside on the curb Ryan and I held our last hug a little longer than we usually do. As he and Allison pulled away in a taxi I walked back upstairs into our apartment. Down the hall I could see Caroline, Jay and Wally playing on the bed, while at the same time I was still thinking about how an entire season would pass before I saw Ryan again. In a moment of confusion my thought about Ryan attached to the image of my family on the bed: I saw Caroline, Jay and Wally as if it were going to be a long time before I saw them again, too. But then I remembered that we are all going to Michigan, and I understood that there’s almost no sadness I can’t withstand as long as the four of us are together. This entry was posted in Stories & Reflections and tagged goodbye brother, Moving with a family, Paesano's Philadelphia by Kevin Hartnett. Bookmark the permalink.